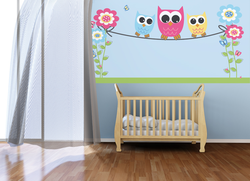 Decorating childrens bedrooms is popular amongst all of us. With Wicked Walls your options are endless and the only hard decision you have is what designs to chose. We work with you to assist you in making a great selection and encourage you to visit our store or phone us for assistance. As the Retailer of Year for 2012 for Pro Art Murals we stand by you with offering service, advice and above all quality. Our Murals are made of quality materials, easy to follow instructions, they are removable and above all a 1300 number for assistance for the life of your mural. Even a first time installer will be able to install our prepasted no mess murals. We also cater for custom design. Please contact us via the contact tab below for assistance and to discuss the process of your custom design mural.